Every facet of the Facit is fantastic, from the ultra-glide action of the cylinder and bearing carriage system to its all-metal body, this machine oozes functionality. And if it’s form you’re after the minimalist Swedish lines represent the egalitarian style evocative in this rich culture. 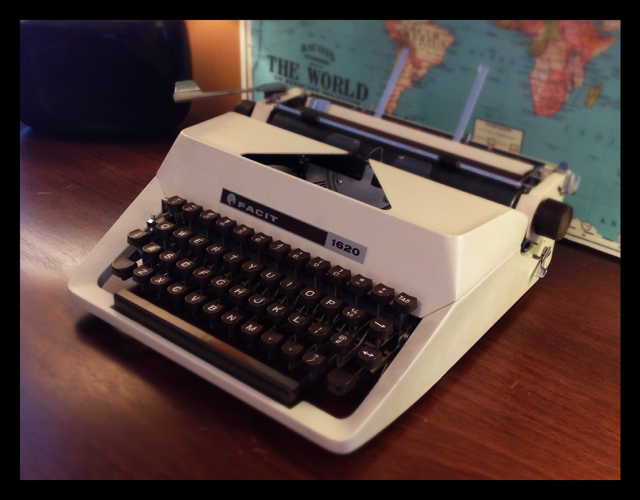 It’s a style that’s timeless and you could easily imagine this typewriter in an Ikea showroom. The above picture doesn’t do justice to the chocolate keys and cream body. And in the design world where packaging enhances product, the Facit comes with a handsome matching suitcase with an interior felt cross-bar that proudly proclaims in gold lettering Made in Sweden. The overall impression is of a company that pays attention to details. The Facit is an easy going typewriter with a basket shift mechanism and keys that don’t need much effort to make a good impression. When you’re typing the carriage seems to float across the line, it’s that smooth and unique among typewriters. If you’re doing lots of writing you’ll know the importance of an easy carriage return. Line after line goes by easily with the Facit. Plus, there’s that X-factor of feel that makes you want to use this machine. Part of it is the cool carriage glide, part is how the key tops feel and the sound they make when striking the platen. 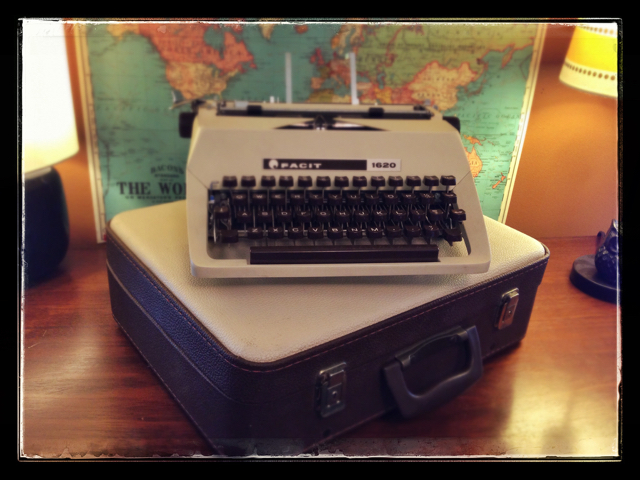 This is the kind of typewriter that will tickle the fancy of your muse. It just feels great. It’s a piece of machinery, but that’s like saying the Apple iPhone is just a mobile device. The closest comparison would be the vaunted Olympia SM9, the gold standard of workmanlike typewriters. The Facit 1620 is similar, but also much different in all the details. The SM9 is precise, but rigid and feels mechanically dull, lifeless. It works, yes, but the Facit has a grace about it, a level of refinement more akin to a Hermes 3000. While the Hermes shares more in style with the Facit, it almost goes overboard in this department. While some prefer to what is called the “buttery” feel of the Hermes, I much prefer the precise touch of the Facit and its more understated color and lines. Does anyone have any comments about the TP1 and TP2? Last year I found searching through the junk in the attic at work a small vinyl suitcase. It was very dirty and dusty. Seeing the key tied with string to the handle I realised immediately what it was; a typewriter. I took the suitcase home on my bike without opening it. I almost fell a few times holding the heavy thing with one hand and with the other the handlebars. With a rag I quickly gave the suitcase a wipe to clear the spider webs and the thick dust. Opening it I first saw a vinyl cover with the name FACIT imprinted on it. Under that cover laid a BRAND NEW unused Facit 1620. Everything was there. The brush, the pelikan ribbon box and the manual. It was a little stiff at first, sitting unused for decades, but with some exercising of the keys and just a little isopropylic alcohol it came back to its senses. There were absolutely no signs of wear on the platten, the letters on the typebars were absolutely clean and shiny. It had a bigger font than the sm3 I use, very crisp and clear. It made writing on it and reading what you wrote a real pleasure. Although it broke my heart a little, I gave it away to a dear friend of mine who couldn’t afford one. The reason that convinced me to give it to her was that she is an aspiring author, writing poems and having some published in literature magazines. The typewriter made her very happy and seeing this, in turn, made me happy. You can’t be an author without a typewriter, just like you can’t be a knight without a sword or a runner without shoes. Nice story! Agreed — every writer needs a typewriter! Just got a Facit TP2 – put it beside my Bluebird and Olympia SM9 for a typing challenge – I have to say that I preferred the Facit – the other two were wonderful but I felt that I could have typed all day on the Facit and not feel tired – it is so easy to type on. Hello, does anyone know where the Facit Blue ranks in the line? Is it a metal body? Special features?